Colorado is a state in the western part of the USA. It's nickname is The Centennial State, and it's motto is nil sine numine which means nothing without providence. The state's name comes from the Colorado River that runs through it. The Spanish travelers that came through the state called the river the Rio Colorado which means the ruddy or reddish colored river. 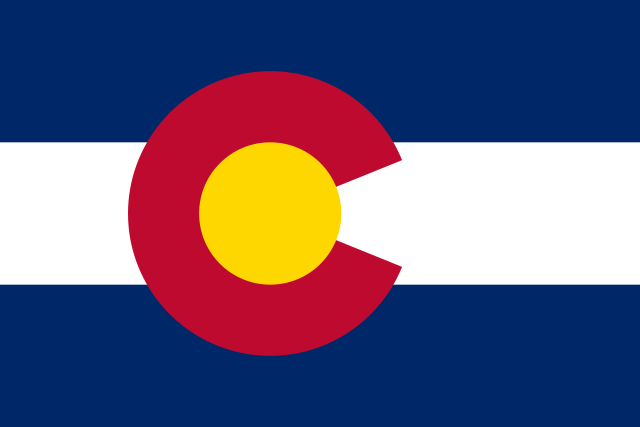 Colorado's state flag has three stripes. A blue stripe, white stripe then blue stripe. The blue is for the skies and the white is for the snow capped mountains. There is a red C in the middle, with a gold circle inside it. The red C is for the ruddy ground in Colorado. The gold circle is for the sunshine and the gold mined in Colorado. The state seal of Colorado has an eye in a triangle which is known as the Eye of Providence or All Seeing Eye, a scroll with the words union and constitution, and something called a fasces, which is like an axe that is used by judges. Below that is a shield with snowy mountains, and a pick and hammer which are tools for miners. It also has the state's motto nil sine numine. The Rocky Mountains are a very long mountain range that go all the way from Canada through the US, and some of the highest peaks are in Colorado. The Mesa Verde is a very old city from some farmers that lived in the area over 1400 years ago. They built a small city in a cavern, and it is now a national park that people go to visit. Deep beneath one of the mountains is a base that people created to be safe in case of a war. They dug out a huge area underneath a rock and made a bunch of buildings, and those buildings are protected by things like giant metal doors with huge locking bars to keep important people safe if there was every a huge war.